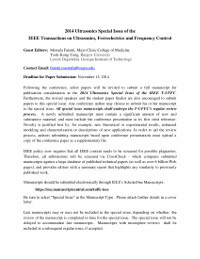 Following the conference, select papers will be invited to submit a full manuscript for publication consideration in the 2014 Ultrasonics Special Issue of the IEEE T-UFFC. Furthermore, the invited speakers and the student paper finalist are also encouraged to submit papers to this special issue. Any conference author may choose to submit his or her manuscript to the special issue. All special issue manuscripts shall undergo the T-UFFC's regular review process. A newly submitted manuscript must contain a significant amount of new and substantive material, and must include the conference presentation as its first cited reference. Novelty is justified best by, for example, new theoretical or experimental results, enhanced modeling and characterization or descriptions of new applications. In order to aid the review process, authors submitting manuscripts based upon conference presentations must upload a copy of the conference paper as a supplementary file. IEEE policy now requires that all IEEE content needs to be screened for possible plagiarism. Therefore, all submissions will be screened via CrossCheck - which compares submitted manuscripts against a large database of published technical papers (as well as over 6 billion Web pages), and provides editors with a summary report that highlights any similarity to previously published work. Be sure to select "Special Issue" as the Manuscript Type. Please attach further details in a cover letter. Late manuscripts may or may not be included in the special issue, depending on whether the review of the manuscript is completed in time for the special issue. The special issue will not be delayed to accommodate late manuscripts. Manuscripts with incomplete reviews shall be included in a subsequent regular issue, if accepted.